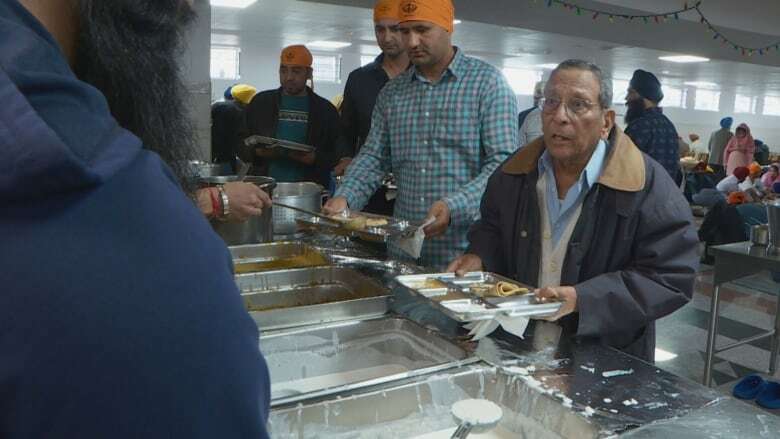 Hundreds of people in Mill Woods take part in langar, a free vegetarian meal to all visitors made by volunteers in the gurdwara’s community kitchen. CBC Edmonton is setting up a pop-up newsroom at the Mill Woods Public Library for the week of Sept. 10-14. We'll be exploring stories and perspectives from one of Edmonton's oldest communities, and will be broadcasting live from the library on Sept. 14. Have a story to pitch? Come say hi! The aroma of freshly cooked Indian food overwhelms you as soon as you enter the food hall in the basement of the Gurdwara Siri Guru Singh Sabha in Mill Woods. It's lunchtime and hundreds of people are filing in after prayer service to take part in langar. 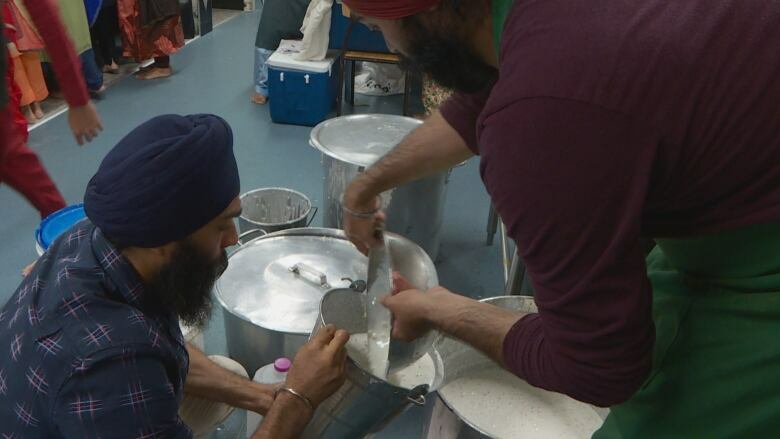 "Anybody who needs langar can come here," said Gurcharn Singh Sangha, president of the gurdwara. Sangha says no one is turned away, regardless of their religion or background. Langar is a long-standing Sikh tradition. All visitors are offered a free vegetarian meal made by volunteers in the gurdwara's community kitchen. Langar was started in 1469 by the religion's founding father Guru Nanak. Sangha said that on any given weekend, an army of volunteers in the kitchen will cook and serve vegetarian meals to nearly 3,000 people, with service between 7 a.m. and 10 p.m.
"This is all volunteer service," Sangha said. "The people who cook here come in the morning at five o'clock." Eleven-year-old Gurleen Kapoor is part of the volunteer army that helps make the food. Kapoor and a friend are responsible for helping butter the dozens of piping hot rotis coming straight off the grill. When asked why she volunteers, Kapoor said, "It's a part of my culture!" The Grade 7 student has been coming to the gurdwara with her family for as long as she can remember. Doing 'seva' —the Punjabi term for 'selfless service' — comes naturally, she said. "It makes me feel happy and it's a nice thing to do," she added. Out on the floor of the food hall, mats are laid out several feet apart and people sit on the floor cross-legged to eat their meals. Several volunteers pace up and down the rows making sure there is food available for anyone who needs it. One of them is Simrandeep Singh Gill, who came to Edmonton from India in 2007. He's been coming to the gurdwara since he arrived. He said he tries to come to the gurdwara as often as he can, for prayer service, and of course the food. "I have to come eat here at least once a month, you know, that's like my diet plan," joked Gill, who was making the rounds with a large bucket of lentils, also known as daal, for those who were eating. Paul Lamba and his family travel up to 30 minutes to attend the gurdwara. He said he's hoping to pass along his culture to his kids. "It is very important for our kids to learn our culture, and to teach the values that we learned growing up, " said Lamba. "It's definitely important for them to come see the things that we grew up with and how important it is to give back to the community and how important it is to do the 'seva,' as we call it, serving the people, and doing it from the heart and doing it honestly."